Taking rent foregone as just as much a subsidy as cash paid out, my back-of-the-fag-packet numbers are that housing subsidies cost £40 to £60 bn a year (£20-£40 bn in lost rents, a wide range as no one actually publishes the figure that I can find, plus £20 bn HB). One estimate of the “economic subsidy” to social housing (the difference between actual rents and those giving an economic return) was that it had reached £6.6 billion across in England as a whole in 2004, slightly higher in real terms than in 1996. Three-fifths of this total went to social tenants in London, the South East and South West. In Northern regions and the Midlands, actual social rents were £10-20 per week below those that would give a comparable return on housing capital values to those in the private sector, but in the East and South East the difference was £40-50, and in London about £70-80. 4) In order to arrive at an implied subsidy or discount to market rent of £40 billion a year, you'd have to assume that these could all be let out for £210 per week each (£40 billion divided by 5 million units divided by 50 weeks = £160, plus official rent of £50). Even taking Tim W's lower figure of £20 billion means that these could all be let out for £130 per week, i.e. 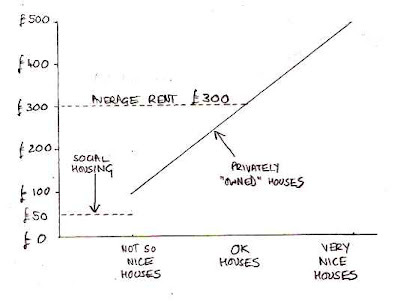 rather more than the weekly rents of £100 for 'not so nice houses'. 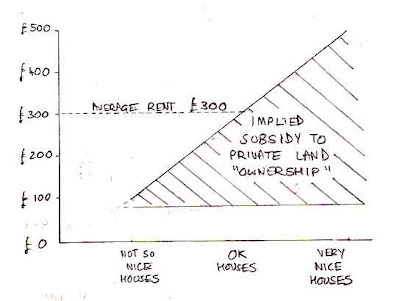 5) Remember that land 'ownership' is a series of local monopolies or a cartel. 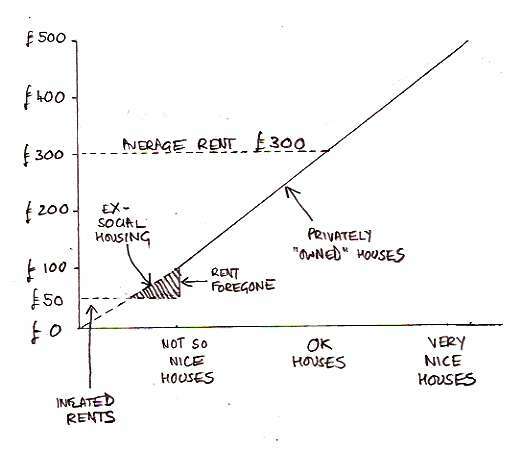 The prices (rental values) of housing have little or nothing do with the owner's input costs (remembering that interest on loans is not an input cost, it is a cost of ownership), the prices are set entirely by what people are willing and able to pay - it is largely because there are practical or political restrictions on the amount of housing that is available that landlords can make super-profits in most areas. 6) So what would happen if the state scrapped Housing Benefit entirely (the bulk of which is a transfer between government departments, and not a cost to the taxpayer as such) and sold off all available social housing? There is a fixed number of people in the UK, with a fixed amount of money to spend and a fixed amount of housing. So while it is quite true that there are some council flats in Westminster which could be let out for at least £500 per week, this is largely because of the scarcity of flats that are available for working people to rent. 7) If all existing social tenants were booted out and all ex-social housing were let at 'market rates' (i.e. 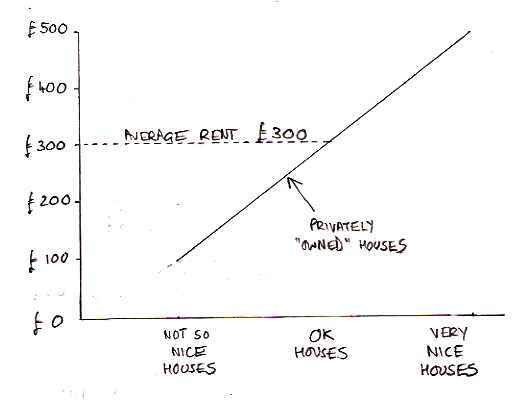 'as much as the new landlord can get'), the chances are that market rents for those Westminster flats would fall below £500 per week (to £450? to £400? ), and the market rents for London flats that had always been privately 'owned' would fall as well (because there'd be far more flats for working people to choose from). And on the council estates where everybody is unemployed, the rents would be +/- nothing, call it £10 or £20 a week, because that is all that people on the dole can afford to pay. 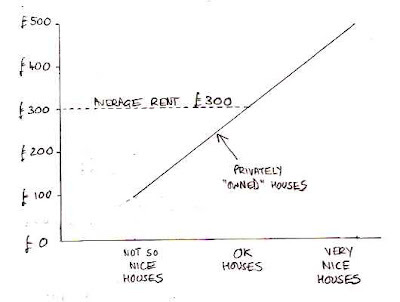 8) To summarise, there's a grey shaded triangle for 'rent foregone' and a white triangle for 'inflated rents'. 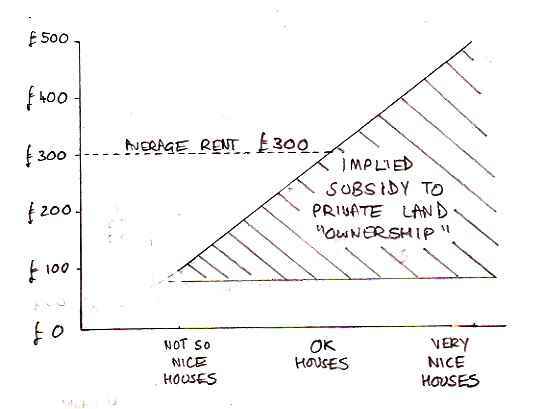 By and large, the two triangles are the same size, so (bearing in mind that the whole curve would shift down slightly if Housing Benefit were scrapped and all social housing sold off) the overall subsidy of [Grey triangle] - [white triangle] probably nets off to very little indeed, probably far less than Professor John Hills' estimate of £6.6 billion a year. * About a third of this is collected by the banks as mortgage interest, but glossing over that, this means that even if Land Value Tax were introduced as an additional tax rather than a replacement tax (which I do not and have not ever proposed - most existing taxes are very bad taxes indeed and ought to be scrapped anyway), annual revenues would be in the order of £125 billion, plus/minus a huge margin of error. Those social tenants can then sit around on the street until prices drop, then buy one. JH, well no, when I say 'booted out', that's short hand for 'the new owner can set his own rents after a transitional period of X months'. So unemployed people in Westminster who can only afford £10 - £20 a week would move to Merthyr Tydfil or Burnley; and people from Merthyr Tydfil or Burnley who are willing to and capable of finding a job in London would move to London; and lower income people in Westminster would swap with higher income people in Barking & Dagenham. It would all level out after a while, that's what markets do. "So what would happen if the state scrapped Housing Benefit entirely (the bulk of which is a transfer between government departments, and not a cost to the taxpayer as such)"
How is this not a cost to the taxpayer? 1. One third of HB goes to 'private' landlords (£7 bn). That is a real cost to the taxpayer, and pushes up rents that private tenants have to pay. 2. Two-thirds of HB goes to pay rents of social tenants (£14 bn). 3. DWP (which gets money from central govt i.e. from taxpayer) pays £14 bn to local councils and housing associations. 4. Local councils pay £14 bn to the central fund for social rent receipts (i.e. back to central govt), which is then dished back out to councils as part of block grant (which dwarfs the amount they get from council tax). 5. 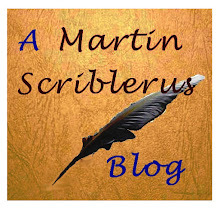 As a thought experiment, imagine that social rents were reduced to £30 per week (approx. the average amount actually paid by social tenants in cash) and HB were scrapped. 6. Then DWP payments to local councils go down by £14 bn and local council payments to central fund go down by £14 bn. 7. Would the taxpayer be better off by £14 bn per year if social rents were halved; HB payments to local councils were scrapped; the central fund for social rents were scrapped; and block grant reduced by £14 bn? No of course not. It's basic book keeping. The bottom line to all my thinking is getting value for taxpayers' money, and HB for social tenants is not an area where we can save money. If we want to save taxpayers £14 bn a year, let's leave the EU instead; and let;s save another £14 bn by scrapping Third World Aid or something. "One third of HB goes to 'private' landlords (£7 bn). That is a real cost to the taxpayer, and pushes up rents that private tenants have to pay." There is no reason for this to be so, it's just the stupid way that HB is set up. 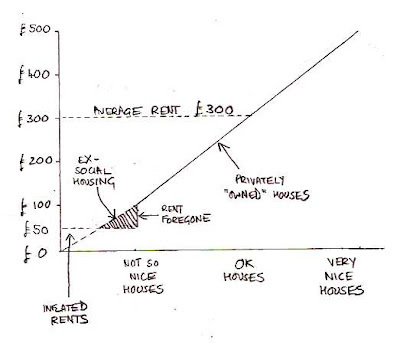 Rents are set by what the prospective tenant can pay (Ricardo). HB is set by what the tenant has to pay, thus we have a classic case of positive feedback. AFAICS, if HB were sensibly capped to the same levels as similar housing for non HB claimants, then this wouldn't happen, nor, as you have just shown, would we need social housing. "Would the taxpayer be better off by £14 bn per year if..."
Social housing is necessarily worse than private housing. The state should be forced to sell them all ASAP for whatever price. Let them be homesteaded, for all I care. B, ideally scrap HB for 'private' landlords and build a bit more social housing. TT, I am a taxpayer like anybody else and I always find it useful to look at "facts" and "logic" before deciding what (if anything) the government 'should' do about something. - Social housing costs me (as a taxpayer) plus/minus nothing, if it were all sold off it would not help reduce government spending or my tax bill by one penny. So I ask, why do you want to take that away from them? Do not be fooled by the £14 bn figure for HB for social tenants, that is purely a number on a bit of paper. Transfers between UK government departments are neither INCOME nor are they SPENDING. i. the taxpayer pays tax, that is a cost to the taxpayer. i. and ii. should of course normally be the same total figure. iii. When on government department pays money to another government department, that is not a cost to the taxpayer. That £14 bn HB is a payment from HM Revenue & Customs to DWP, and the DWP pays it to the local councils, the local councils pay it back to the central fund, the government takes the central fund and pays it back to local councils. If you really want to count each of these payments as a cost, then you could argue that HB costs us £52 billion a year. Why not scrap social housing instead? Local Authorities are not necessarily any better landlords than the private sector and they have political considerations to complicate matters. If the state wishes to prevent social unrest by housing the poor, why should it not achieve this by paying private landlords? Ricardo's law states that if it only offers to pay a little, then rents will remain low. Experience from the past says that low returns will not necessarily discourage private landlords from renting to the poor. B, in a perfect LVT-CI world, of course we wouldn't need social housing. But it's a package, I'm not going to campaign for selling off social housing until and unless the home-owners are paying a fair price as well. I recognise that it is not a cost to the taxpayer at the point it is moved between departments, but it is before this happens. Instead of moving it around, they can let the taxpayers have it back, i.e. not take it in the first place. Social housing should end. It perpetuates poverty and misallocation. Besides, round my way it's the power base of the Labour mafia. You want a flat? Better be related. TT, we've drifted off topic a bit. 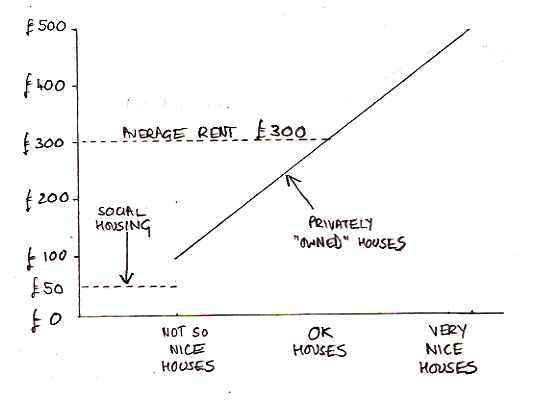 I was trying to explain the way that things are, which is that social housing does not cost the taxpayer very much at all, and the much vaunted discounts to market rents don't really exist if you look at it closely. 1. Social housing costs the taxpayer little or nothing in cash terms. 2. Discounts to market value are largely illusory (and cost the taxpayer nothing in cash terms). You may well be correct with your proposals, but that's like suggesting that we leave the EU in response to a post about statistics on domestic violence against women. Just because it happens to be a good idea to leave the EU does not mean that this will reduce domestic violence. "I was trying to explain the way that things are, which is that social housing does not cost the taxpayer very much at all, and the much vaunted discounts to market rents don't really exist if you look at it closely." Really ? In London all the people I know in council houses pay a lot less than those who rent privately - often for a lot nicer housing. "the chances are that market rents for those Westminster flats would fall below £500 per week (to £450? to £400? ),"
So aren't you saying that tax payers who want to live in westminster are losing £100 p.w. because of rent subsidises - that seems a lot to me. Anon, central London is an extreme case and I have long argued that lower income people generally would be better served if the flats in desirable areas were let out on the open market and the money used to build more social housing a bit further out. If they did this, then rents in central London might fall a bit (to £450, to £400, who knows) which would make those people who want to rent in central London better off, including those people who currently rent privately. However, this is potential tenants in central London who are losing out (and private landlords who are gaining), it is of no direct concern to The Taxpayer.